Crazy things can happen when galaxies collide, as they sometimes do. Although individual stars rarely impact each other, the gravitational interactions between galaxies can pull enormous amounts of gas and dust into long streamers, spark the formation of new stars, and even kick objects out into intergalactic space altogether. This is what very well may have happened to SDSS1133, a suspected supermassive black hole found thousands of light-years away from its original home. The two bright spots at the disturbed core of Markarian 177 are thought to indicate recent star formation, which could have occurred in the wake of a previous collision. Interactions between supermassive black holes during a galactic collision would also result in gravitational waves, elusive phenomena predicted by Einstein that are high on astronomers’ most-wanted list of confirmed detections. But besides how it got to where it is, the true nature of SDSS1133 is a mystery as well. The persistently bright near-infrared source has been detected in observations going back at least 60 years. Whether or not SDSS1133 is indeed a supermassive black hole has yet to be determined, but if it isn’t then it’s a very unusual type of extremely massive star known as an LBV, or Luminous Blue Variable. If that is the case though, it’s peculiar even for an LBV; SDSS1133 would have had to have been continuously pouring out energy in a for over half a century until it exploded as a supernova in 2001. To help determine exactly what SDSS1133 is, continued observations with Hubble’s Cosmic Origins Spectrograph instrument are planned for Oct. 2015. “We found in the Pan-STARRS1 imaging that SDSS1133 has been getting significantly brighter at visible wavelengths over the last six months and that bolstered the black hole interpretation and our case to study SDSS1133 now with HST,” said Yanxia Li, a UH Manoa graduate student involved in the research. And, based on data from NASA’s Swift mission the UV emission of SDSS1133 hasn’t changed in ten years, “not something typically seen in a young supernova remnant” according to Michael Koss, who led the study and is now an astronomer at ETH Zurich. Regardless of what SDSS1133 turns out to be, the idea of such a massive and energetic object soaring through intergalactic space is intriguing, to say the least. The study will be published in the Nov. 21 edition of Monthly Notices of the Royal Astronomical Society. But in this case, it is… a lost moon of Neptune not seen since its discovery in the late 1980’s. A new announcement from the 45th Meeting of the Division for Planetary Sciences of the American Astronomical Society being held this week in Denver, Colorado revealed the recovery of a moon of Neptune that was only briefly glimpsed during the 1989 flyby of Voyager 2. 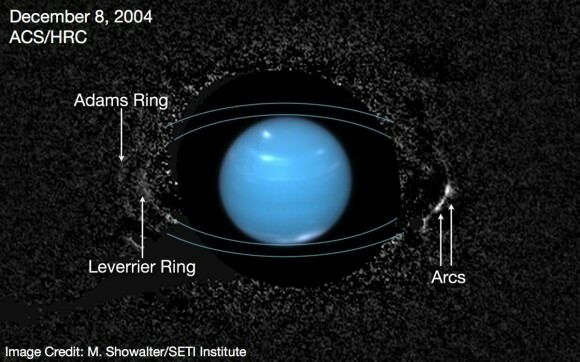 The re-discovery Naiad, the innermost moon of Neptune, was done by applying new processing techniques to archival Hubble images and was announced today by Mark Showalter of the SETI institute. Collaborators on the project included Robert French, also from the SETI Institute, Dr. Imke de Pater of UC Berkeley, and Dr. Jack Lissauer of the NASA Ames Research Center. The findings were a tour-de-force of new techniques applied to old imagery, and combined the ground-based 10 meter Keck telescope in Hawaii as well as Hubble imagery stretching back to December 2004. The chief difficulty in recovering the diminutive moon was its relative faintness and proximity to the “dazzling” disk of Neptune. At roughly 100 kilometres in diameter and an apparent magnitude of +23.9, Naiad is over a million times fainter than +8th magnitude Neptune. It’s also the innermost of Neptune’s 14 known moons, and orbits once every 7 hours just 23,500 kilometres above the planet’s cloud tops. Neptune itself is about 49,000 kilometres in diameter, and only appears 2.3” in size from Earth. From our Earthly vantage point, Naiad only strays about arc second from the disk of Neptune, a tiny separation. “Naiad has been an elusive target ever since Voyager left the Neptune system,” Showalter said in a recent SETI Institute press release. Voyager 2 has, to date, been the only mission to explore Uranus and Neptune. To catch sight of the elusive inner moon, Showalter and team applied new analyzing techniques which filtered for glare and image artifacts that tend to “spill over” from behind the artificially occulted disk of Neptune. Naiad as seen from Voyager 2. (Credit: NASA/JPL). Other moons, such as Galatea and Thalassa — which were also discovered during the 1989 Voyager 2 flyby — are also seen in the new images. In fact, the technique was also used to uncover the as of yet unnamed moon of Neptune, S/2004 N1 which was revealed earlier this year. Naiad is named after the band of nymphs in Greek mythology who inhabited freshwater streams and ponds. The Naiads differed from the saltwater-loving Nereids of mythology fame, after which another moon of Neptune discovered by Gerard Kuiper in 1949 was named. It’s also intriguing to note that Naiad was discovered in a significantly different position in its orbit than expected. Clearly, its motion is complex due to its interactions with Neptune’s other moons. “We don’t quite have enough observations to establish a refined orbit,” Mr. Showalter told Universe Today, noting that there may still be some tantalizing clues waiting to be uncovered from the data. I know the burning question you have, and we had as well during the initial announcement today. Is it REALLY Naiad, or another unknown moon? Showalter notes that this possibility is unlikely, as both objects seen in the Hubble and Voyager data are the same brightness and moving in the same orbit. To invoke Occam’s razor, the simplest solution— that both sightings are one in the same object —is the most likely. “Naiad is well inside Neptune’s Roche Limit, like many moons in the solar system,” Mr. Showalter also told Universe Today. Naiad is also well below synchronous orbit, and is likely subject to tidal deceleration and may one day become a shiny new ring about the planet. The labeled ring arcs of Neptune as seen in newly processed data. The image spans 26 exposures combined into an equivalent 95 minute exposure. The ring trace and an image of the occulted planet Neptune is added for reference. (Credit: M. Showalter/SETI Institute). And speaking of which, the tenuous rings of Neptune have also evolved noticeably since the 1989 Voyager flyby. First discovered from the ESO La Silla Observatory in 1984, data using the new techniques show that the knotted ring segments named the Adams and Le Verrier have been fading noticeably. “In a decade or two, we may see an ‘arc-less’ ring,” Showalter noted during today’s Division for Planetary Sciences press conference. The two ring segments observed are named after Urbain Le Verrier and John Couch Adams, who both calculated the position of Neptune due to orbital perturbations of the position of Uranus. Le Verrier beat Adams to the punch, and Neptune was first sighted from the Berlin Observatory on the night of September 23rd, 1846. Observers of the day were lucky that both planets had undergone a close passage just decades prior, or Neptune may have gone unnoticed for considerably longer. The rings of Neptune as seen from Voyager 2 during the 1989 flyby. (Credit: NASA/JPL). Neptune has completed just over one 164.8 year orbit since its discovery. It also just passed opposition this summer, and is currently a fine telescopic object in the constellation Aquarius. Unfortunately, there aren’t any plans for a dedicated Neptune mission in the future. New Horizons will cross the orbit of Neptune in August 2014, though it’s headed in the direction of Pluto, which is currently in northern Sagittarius. New Horizons was launched in early 2006, which gives you some idea of just how long a “Neptune Orbiter” would take to reach the outermost ice giant, given today’s technology. This represents the first time that Naiad has been imaged from the vicinity of Earth, and demonstrates a new processing technique capable of revealing new objects in old Hubble data. “We keep discovering new ways to push the limit of what information can be gleaned from Hubble’s vast collection of planetary images,” Showalter said in the SETI press release. Congrats to Showalter and team on the exciting recovery… what other moons, both old and new, lurk in the archives waiting to be uncovered? – Read today’s SETI Institute press release on the recovery of Naiad. -Be sure to follow all the action at the 45th DPS conference in Denver this week! “Primordial hydrogen” sounds like a great name for a band. It’s also a great thing to find when you’re looking at a galaxy. This ancient gas is a leftover of the Big Bang, and astronomers discovered it in a faraway star-forming galaxy that was created when the universe was young. A continuous stream of gas was likely responsible for a cornucopia of star formation that took place about 10 billion years ago, when galaxies were churning out starbirths at a furious rate. The astronomers spotted the gas by using a quasar that lit up the fuel from behind. Quasars a handy tool to use if you want to illuminate something, because even though quasars don’t live for very long in cosmic terms — they occur when matter falls into a ginormous black hole — they are extremely bright. Since the gas absorbs the light at certain frequencies, the absorption lines that show up in spectrometers reveal information about the composition, temperature and density of the gas. “This is not the first time astronomers have found a galaxy with nearby gas, revealed by a quasar. But it is the first time that everything fits together,” stated Neil Crighton, who is with the Max Planck Institute for Astronomy and Swinburne University and led the research. His team found the galaxy using the Keck I telescope in Hawaii. Q1442-MD50 (as the galaxy is called) is 11 billion light years away from us — pretty close to the start of the universe about 13.8 billion years ago. The quasar that lit it up is called QSO J1444535+291905. You can read more details in the article (which is in Astrophysical Letters) or in this preprint version on Arxiv. According to research by NASA astronomers using the next-generation optics of the 10-meter Keck II telescope, Jupiter’s ice-encrusted moon Europa has hydrogen peroxide across much of the surface of its leading hemisphere, a compound that could potentially provide energy for life if it has found its way into the moon’s subsurface ocean. The paper, co-authored by Mike Brown of the California Institute of Technology in Pasadena, analyzed data in the near-infrared range of light from Europa using the Keck II Telescope on Mauna Kea, Hawaii, over four nights in September 2011. The highest concentration of peroxide found was on the side of Europa that always leads in its orbit around Jupiter, with a peroxide abundance of 0.12 percent relative to water. (For perspective, this is roughly 20 times more diluted than the hydrogen peroxide mixture available at drug stores.) The concentration of peroxide in Europa’s ice then drops off to nearly zero on the hemisphere of Europa that faces backward in its orbit. Hydrogen peroxide was first detected on Europa by NASA’s Galileo mission, which explored the Jupiter system from 1995 to 2003, but Galileo observations were of a limited region. The new Keck data show that peroxide is widespread across much of the surface of Europa, and the highest concentrations are reached in regions where Europa’s ice is nearly pure water with very little sulfur contamination. The peroxide is created by the intense radiation processing of Europa’s surface ice that comes from the moon’s location within Jupiter’s strong magnetic field. What’s notable to add, on March 26, 2013, the U.S. President signed a bill that would increase the budget for NASA’s planetary science program as well as provide $75 million for the exploration of Europa. Exactly how the funds will be used isn’t clear — perhaps for components on the proposed Europa Clipper mission? — but it’s a step in the right direction for learning more about this increasingly intriguing world. Read more on SETI’s Destination: Europa blog. Many of the brightest, most actively star-forming galaxies in the Universe were actually undetectable by Earth-based observatories, hidden from view by thick clouds of opaque dust and gas. Thanks to ESA’s Herschel space observatory, which views the Universe in infrared, an enormous amount of these “starburst” galaxies have recently been uncovered, allowing astronomers to measure their distances with the twin telescopes of Hawaii’s W.M. Keck Observatory. What they found is quite surprising: at least 767 previously unknown galaxies, many of them generating new stars at incredible rates. Although nearly invisible at optical wavelengths these newly-found galaxies shine brightly in far-infrared, making them visible to Herschel, which can peer through even the densest dust clouds. Once astronomers knew where the galaxies are located, they were able to target them with Hubble and, most importantly, the two 10-meter Keck telescopes — the two largest optical telescopes in the world. By gathering literally hundreds of hours of spectral data on the galaxies with the Keck telescopes, estimates of their distances could be determined as well as their temperatures and how often new stars are born within them. A representation of the distribution of nearly 300 starbursts in one 1.4 x 1.4 degree field of view. The galaxies, many of them observed as they were during the early stages of their formation, are producing new stars at a rate of 100 to 500 a year — with a mass equivalent of several thousand Suns — hence the moniker “starburst” galaxy. By comparison the Milky Way galaxy only births one or two Sun-mass stars per year. The reason behind this explosion of star formation in these galaxies is unknown, but it’s thought that collisions between young galaxies may be the cause. Another possibility is that galaxies had much more gas and dust during the early Universe, allowing for much higher star formation rates than what’s seen today. “It’s a hotly debated topic that requires details on the shape and rotation of the galaxies before it can be resolved,” said Dr. Casey. Still, the discovery of these “hidden” galaxies is a major step forward in understanding the evolution of star formation in the Universe. The papers detailing the results were published today online in the Astrophysical Journal. Sources: W.M. Keck Observatory article and ESA’s news release. Image credits: ESA–C. Carreau/C. Casey (University of Hawai’i); COSMOS field: ESA/Herschel/SPIRE/HerMES Key Programme; Hubble images: NASA, ESA. Inset image courtesy W. M. Keck Observatory. Installed into the Keck I observatory, MOSFIRE — which stands for Multi-Object Spectrometer For Infra-Red Exploration — is able to gather light in infrared wavelengths. This realm of electromagnetic radiation lies just beyond red on the visible spectrum (the “rainbow” of light that our eyes are sensitive to) and is created by anything that emits heat. By “seeing” in infrared, MOSFIRE can peer through clouds of otherwise opaque dust and gas to observe what lies beyond — such as the enormous black hole that resides at the center of our galaxy. MOSFIRE can also resolve some of the most distant objects in the Universe, in effect looking back in time toward the period “only” a half-billion years after the Big Bang. Because light from that far back has been so strongly shifted into the infrared due to the accelerated expansion of the Universe (a process called redshift) only instruments like MOSFIRE can detect it. The instrument itself must be kept at a chilly -243ºF (-153ºC) in order to not contaminate observations with its own heat. Astronomers also plan to use MOSFIRE to search for brown dwarfs — relatively cool objects that never really gained enough mass to ignite fusion in their cores. Difficult to image even in infrared, it’s suspected that our own galaxy is teeming with them. The impressive new instrument has the ability to survey up to 46 objects at once and then do a quick-change to new targets in just minutes, as opposed to the one to two days it can typically take other telescopes! Images taken on the nights of April 4 and 5 are just the beginning of what promises to be a new heat-seeking era for the Mauna Kea-based observatory! Read more on the Keck press release here. The W. M. Keck Observatory operates two 10-meter optical/infrared telescopes on the summit of Mauna Kea on the Big Island of Hawaii. The spectrometer was made possible through funding provided by the National Science Foundation and astronomy benefactors Gordon and Betty Moore. There are two Keck telescopes – Keck I and Keck II; together they make up the W.M. Keck Observatory, though strictly speaking the observatory is a great deal more than just the telescopes (there’s all the instrumentation, especially the interferometer, the staff, support facilities, etc, etc, etc.). William Myron Keck (1880-1964) established a philanthropic foundation in 1954, to support scientific discoveries and new technologies. One project funded was the first Keck telescope, which was quite revolutionary at the time. Not only was it the largest optical telescope (and it still is) – it’s 10 meters in diameter – but is made up of 36 hexagonal segments, the manufacture of which required several breakthroughs … and all 36 are kept in line by a system of sensors and actuators which adjusts their position twice a second. Keck I saw first light in 1993. Like nearly all modern, large optical telescopes, the Keck telescopes are alt-azimuth. Fun fact: to keep the telescope at an optimal working temperature – no cool-down period during the evening – giant aircons work flat out during the day. The Keck telescopes are on the summit of Hawaii’s Mauna Kea, where the air is nearly always clear, dry, and not turbulent (the seeing is, routinely, below 1″); an ideal site for not only optical astronomy, but also infrared. The second Keck telescope – Keck II – saw first light in 1996, but its real day of glory came in 1999, when one of the first adaptive optics (AO) systems was installed on it (the first installed on a large telescope). 2004 saw another first for the Keck telescope – a laser guide star AO system, which gives the Keck telescopes a resolution at least as good as the Hubble Space Telescope’s (in the infrared)! And in 2005 the two Keck telescopes operated together, as an interferometer; yet another first. To learn more, I suggest that you start with the official W.M. Keck Observatory website! Revolution in Telescope Design Debuts at Keck After Birth Here is a 1992 Lawrence Berkeley Lab article which captures some the excitement of those early days; and The Keck Telescopes viewed from the North puts the Keck telescopes in the Mauna Kea context. Universe Today has covered the Keck telescopes, many times, in many different ways; for example, Keck Uses Adaptive Optics for the First Time, Binary Icy Asteroid in Jupiter’s Orbit, and New Technique Finds Farthest Supernovae. Astronomy Cast has a couple of episodes on the Keck telescopes; check them out! The Rise of the Supertelescopes, and Adaptive Optics.